Tracking your queries is a must. You don’t want to double-send or worse, miss one. You need to know who replied and who you are waiting on still. You need to know who asked for partials or fulls and when you sent them. Every writer will have their own favorite method, and I invite any of our readers to share their methodology in the comments. What works for one writer may not work for another. The point is not to track using a specific method, but to use the method that works best for you. My method is pretty simple—I use an Excel spreadsheet. 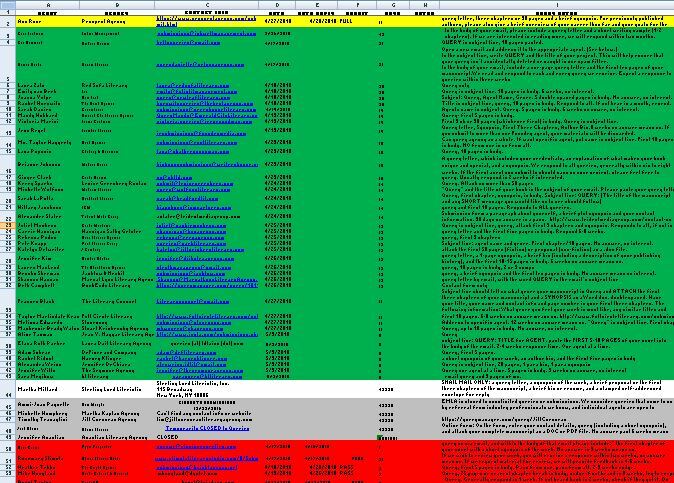 My columns are: Agent, Agency, Contact Info, Date Sent, Date Reply, Result, Days Out, Notes, and Query Notes. 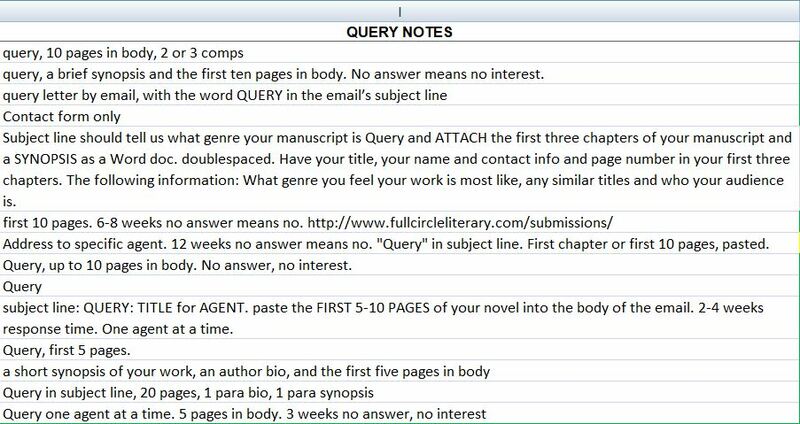 In the beginning, as I am compiling names and agencies, I use the Query Notes column to note what that particular agent’s submission guidelines calls for. Some want just the query, some want 3-50 pages, some want a synopsis, some want an author bio, and some use online submission forms. This is a timesaver because it keeps me from having to look up their website when it comes time to send the query. Most of the columns are self-explanatory. Days Out contains a formula calculating how many days it has been since I sent the query. Why? Because many agencies have a no-answer-means-no policy. Some will say “If you don’t hear within 6 weeks, assume a pass” or other time-based language. So I need to know if we have passed that mark. Other no-answer agencies don’t specify a time, and so I give them 6 months. Step one is filling out all those notes when I make my list of 50 agents. Then I start compiling the queries and send them out. I find I can only do about 5 at one sitting, to make sure I get the various details of what they want correct. I do often do more than one sitting in a day, if time allows. As I send them out, my favorite tool in Excel comes into play: Color coding! When I send one out, I fill the row with green. If I get a rejection, I change it to red. If I get a request, I make it yellow. Then I sort the rows by color, so the requests are always on top, the active queries are below them, the ones not sent (no color) are third, any that are temporarily closed to queries are next (gray) and the rejections are at the bottom. This sorting keeps me from having to scroll in search of the active requests or queries. So that’s how I track my queries. What works for you? Great advice! I participated in a pitch fest, so there were only three agents to hear from. Other than that, I’ve never tried querying agents. But I’m thinking about trying, so this post comes in handy. I think the Excel method would work best for me, too. Thank you!